Elizabeth Sefton recently learned she will be heading to the University of Cambridge in the fall—and she cannot wait. Sefton was one of 45 students named 2008 Gates Cambridge scholars among this year’s 600 applicants. The scholarship, which funds graduate study at the University of Cambridge, was established in 2000 by a $210 million donation by Bill and Melinda Gates. 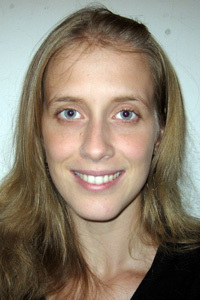 At Chicago, Sefton received a Howard Hughes Undergraduate Research fellowship. Her undergraduate thesis in Vicky Prince’s lab focused on pharynx development in zebrafish, an issue more broadly linked with feeding mechanisms. She credits the fellowship and the emphasis on undergraduate research at Chicago for allowing her to better shape and define her interests and goals. Beyond the classroom, Sefton found another passion at Chicago through University Theater, where she assumed many roles, including actor, assistant director, stage manager and scenic designer, which Sefton said was her favorite. Additionally, she taught theater workshops to local children and volunteered at the Children’s Place Association, a Chicago-based service agency for children who are affected by HIV/AIDS. In what spare time she can find, Sefton said she loves to indulge in other interests, such as crocheting and her love of animals—particularly the giant tropical millipede that serves as her roommate. At the University of Cambridge, Sefton will work toward her M.Phil. in Zoology through studies of segmentation of arthropods—a group that possesses 80 percent of living animals on the planet, including all insects and crustaceans. “I’m looking forward to working with Michael Akam, a pioneer in the field of evolution and development,” Sefton said. Of her post-graduate plans, Sefton said the only thing she knows for certain is that she wants to continue doing research, whether at a museum or a university. “After spending years at a university so rich with research like Chicago, I know that it’s something I enjoy and want to continue to do,” Sefton said.